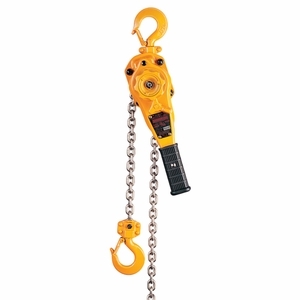 To many, this is the "Cadillac" of lever chain hoists. The LB Series of lever chain hoists offers a low headroom, compact design that makes it perfect for use in tight quarters. It's preferred by many construction, mining, manufacturing, shipbuilding and other industrial users the world over. While the complete list of features and benefits is too long to list here, let's go over a few key highlights. Each hoist is factory tested to 125% of the rated capacity. It features an all-steel construction yet weighs less than many aluminum models offered by competitors. There is a positive braking action with a Weston-style load brake that uses moisture-resistant brake pads. A patented spring-loaded freewheel mechanism permits easy adjustment of the load chain and safeguards against accidental freewheeling under load. There are more great features to be sure, but perhaps the best way to see them all is to order your Harrington LB hoist today!